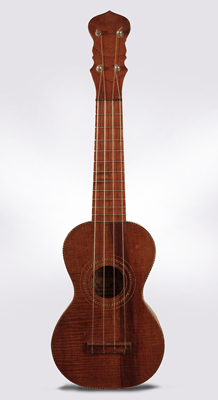 "Chicago Hawaiian" Model Soprano Ukulele, most likely made by Harmony, c. 1920, probably Chicago, natural varnish finish, koa wood body and neck, original canvas case. Overall length is 20 3/4 in. (52.7 cm. ), 6 1/8 in. (15.6 cm.) wide at lower bout, and 2 1/16 in. (5.2 cm.) in depth at side, taken at the end block. Scale length is 13 in. (330 mm.). Width of nut is 1 1/2 in. (38 mm.). One long repaired top crack, with a second by the lower edge of the bridge, otherwise very nice. Label is intact but has some staining. A nice example of a 1920's faux Hawaiian uke. Excellent - Condition.